Sometimes an ebook or audio book is simply more covenient and there’s no doubt they’re here to stay. But I’ll always prefer paper books for the same reasons given in the blog. Also, I think you only have to walk into a library to see the appeal of packed book shelves. Plus I like to smell the pages! Even though I predominantly read on my Kindle now, I still love reading paperbacks. Especially when I find a great used book where someone has scribbled notes in the margins or highlighted it. eBooks just don’t have that feeling of an individual history. I’m a book person too! Paperback or hardcover…. i feel more relaxed on a beach with a book than with an ipad…. 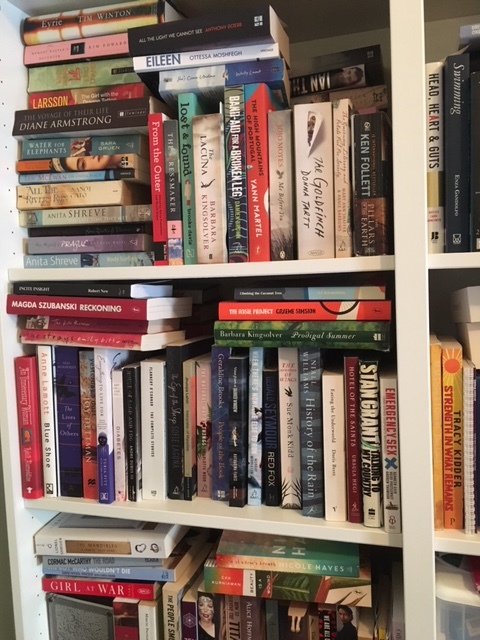 even in bed reading a book feels like you have isolated yourself from the outside world- no temptation to check socoal media etc…and can become engrossed in the world you are reading…. Paperback is my preferred format too, I also find them easier on my eyes. I love the feel of books but these days it is so much easier to manipulate a kindle. Still, there is so much to be said about the bookcase. I miss it. I’m a bit of both. As you say, travelling with an e-book is easier than with a print publication. And some books I’d never get to read if I didn’t buy them in e-book form. However, I can still be found at our local library a couple of times a week. And there’s nothing quite like curling up with a good book. Oh yes! Especially on a cold winters day. Although I have books on a Kindle and my i-Pad, I’m definitely a fan of printed books. I can totally relate to this post. I like to feel the cover of the book. I’m not as engaged when I’m reading on my iPhone or iPad. I take my books with a cup of tea or little snack on the side😁. A perfect combination. Thanks for stopping by.